Here are 29 facts about lung cancer that everyone should be aware of – after all, we all have lungs. And, lung cancer accounts for more deaths every year than any other cancer and more than breast, prostate, and colon cancer combined. Stay informed! Read each section for more lung cancer facts, information, and statistics. 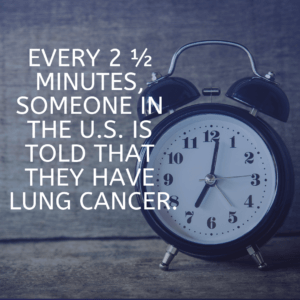 Lung Cancer Facts: Did you know? Currently, 1 in 15 people in the U.S. can expect to receive a lung cancer diagnosis. That’s 1 out of every 14 men, and 1 out of every 17 women. Lung cancer kills almost twice as many women as breast cancer, and more than three times as many men as prostate cancer. Lung cancer is the leading cancer killer among women in the U.S. — it surpassed breast cancer in 1987. Smoking isn’t the only cause of lung cancer. Other known causes of lung cancer include exposure to secondhand smoke, air pollution, radon, and asbestos. 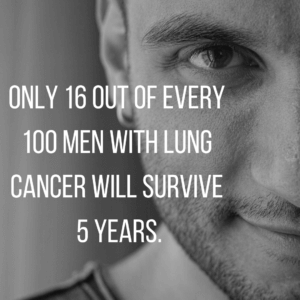 Fewer than 1 in 7 lung cancer patients will be diagnosed in the earliest stage, when the disease is most treatable. There isn’t just one lung cancer – every lung cancer is unique. Lung cancer is a group of diseases defined by the genetic makeup of the lung cancer tumors. During the past 39 years, the lung cancer death rate has fallen 29% among men while increasing 102% among women. There is currently no cure for lung cancer, however new research is making it possible for people to live with their lung cancer, managing it like a chronic disease. You can be a part of this progress by supporting research. An estimated 142,670 lung cancer deaths are expected to occur in 2019 in the United States, accounting for about 27% of all cancer deaths nationwide. Sadly, federal funding for lung cancer research per related death was just $1,680 compared to $24,846 for breast cancer, $12,644 for prostate cancer, and $6,344 for colon cancer in 2018. With a 19% five-year survival rate, lung cancer ranks the lowest among the other most common cancers: prostate cancer (99%), breast cancer (89%), and colorectal cancer (65%). Lung cancer kills 433 people each day in the U.S. — that’s the same number of seats on a Boeing 747 airplane. 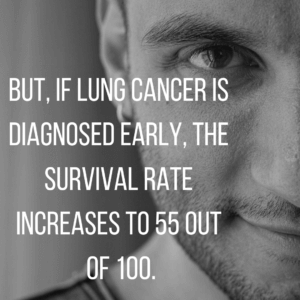 Every 3.3 minutes, someone in the U.S. dies of lung cancer. 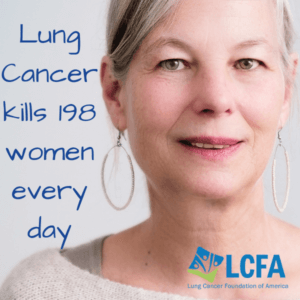 It’s estimated that more than 66,000 American women will die of lung cancer in 2019 — that’s 181 women each day, or 8 per hour (or one death every 7 minutes). An estimated 224,390 people in the U.S. will be diagnosed with lung cancer in 2019. That’s 615 people each day, 26 people each hour, and one person every 2½ minutes. Smoking is still a high-risk factor for lung cancer. There were an average of 130,659 lung cancer deaths due to smoking each year between 2005 and 2010; every year, approximately 7,330 lung cancer deaths are due to secondhand smoke exposure. Radon causes about 21,000 lung cancer deaths each year, making it the second leading cause of lung cancer death. An estimated 23% of lung cancer deaths worldwide are caused by indoor or outdoor air pollution. Most lung cancer symptoms can be associated with other health issues. Testing for lung cancer is often overlooked until many other options are ruled out. If lung cancer is caught before it spreads, the likelihood of surviving 5 years or more improves to 55%. Early detection through low-dose CT screening can decrease lung cancer mortality rates by 14%-20% among high-risk populations. Half of the women who are diagnosed with lung cancer (50.1%) will survive just one year. Only one in 5 of those women who are diagnosed with lung cancer (22%) will survive to 5 years. 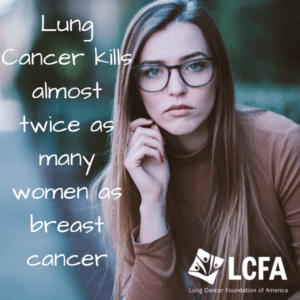 Among women, the lifetime risk of dying from lung cancer is 82% greater than the risk of dying from breast cancer (the second leading cancer killer of women). 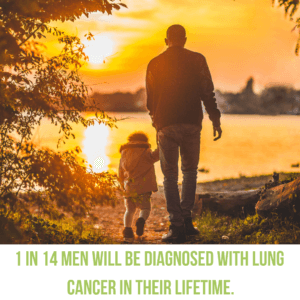 Lung cancer is more common in men than women, particularly African American men. The chance of getting lung cancer increases with age, and, of course, with a smoking history. Interested in knowing more about lung cancer research? Join us to hear about the latest lung cancer research news. Employees who smoke cost their employer nearly $6,000 more each year compared to non-smoking employees. $13.4 billion was spent on lung cancer care in 2015. More was spent on care in the last year of life ($5.5 billion) for lung cancer than any other cancer in 2015. The $39 billion in lost productivity due to lung cancer deaths was more than the next 4 costliest cancers combined. Help change these terrible statistics! 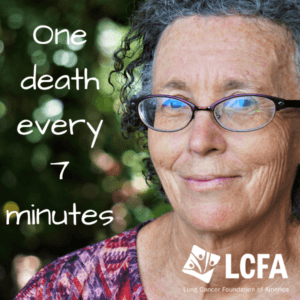 Your donation will increase LCFA’s ability to fund additional innovative lung cancer investigators each year. 2. Centers for Disease Control and Prevention. National Center for Health Statistics. CDC WONDER On-line Database, compiled from Compressed Mortality File 1999-2014 Series 20 No. 2T, 2016. 5. U.S. Department Of Health And Human Services. The Health Consequences of Smoking — 50 Years of Progress: A Report of the Surgeon General. 2014.